Netflix Pops on Earnings Results, Then What Happened? 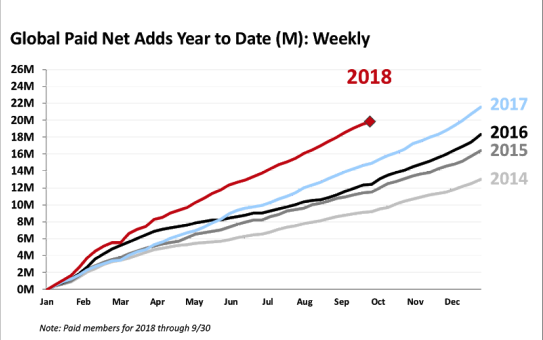 Netflix reported third quarter results, and while revenue and EPS were a bit of a mixed bag, the news is that subscriber growth is coming in well higher than anticipated. That shot the stock up the day after earnings, but all of that gain has disappeared in the following days. There may be reason behind that, beyond "the market went down so everything went down." * EPS: $0.23 vs $0.51 (down guide). CEO Reed Hastings noted that operating costs would be higher in the fourth quarter, noting a "sequential decline in operating margin in the second half of 2018 is due to the timing of content spend and a higher mix of original films in Q4'18." Here is a revenue (TTM) (blue bars) and net income (TTM) (orange line) for Netflix, but this chart does not yet include the newest data from this earnings release. Subscriber growth is the story -- a that has thrust the stock price higher in the after hours trade. * Subscriber Net Addition Guidance: 9.4M vs 7.2M estimates. We're thrilled to be growing internet entertainment across the globe. Streaming revenue grew 36% year over year in Q3. [A]verage paid membership increased 25% and ASP rose 8%. Operating margin expanded 500 bps year over year to 12%. Free cash flow in Q3 was -$859 million vs. -$465 million in the year ago quarter. As a reminder, our growing mix of self-produced content, which requires us to fund content during the production phase prior to its release on Netflix, is the primary driver of our working capital needs that creates the gap between our positive net income and our free cash flow deficit. Before this quarter, here is a chart of levered free cash flow for Netflix aggregated into trailing twelve month bundles. We expect our quarterly FCF deficit will increase sequentially from Q3 to Q4 as our year to date FCF is -$1.7 billion. We recognize we are making huge cash investments in content, and we want to assure our investors that we have the same high confidence in the underlying economics as our cash investments in the past. These investments we see as very likely to help us to keep our revenue and operating profits growing for a very long time ahead. The issue here, if there is one, is not doubting the company's remarkable revenue and net income growth, but rather the fact that when the company spends a lot, it can grow subscribers, but when it spends less, like two quarters ago, it sees a miss in sub growth. If that is the reality, which CEO Hastings has more or less said out loud, Netflix investors are faced with a decision. Even if Netflix hits estimates, it will be trading at a forward PE for this full fiscal year of 125. Taking it out another year, with more growth, the forward PE for fiscal year 2020 is still over 80. When we see free cash flow getting worse moving forward, per the CEO, operating margins shrinking in the near term, per the CEO, and a growth trajectory that is certainly working, but also requires a spend on content that seems never end (see Q2 miss) along with a guidance down in revenue as well for next quarter, a 125 PE is a tough sell. Or, let's say, it could be a tough sell. If Netflix stock rises, that PE will get larger, which further expands the valuation. It's a choice for investors, one way or the other. All of this data is freely available to anyone on any stock from www.CMLviz.com on the Analysts Tab. You can see Insider and Large Shareholder Trades by tapping that link -- there was no significant movement in the last 3-months. The author has no position in Netflix stock at the time of this writing.